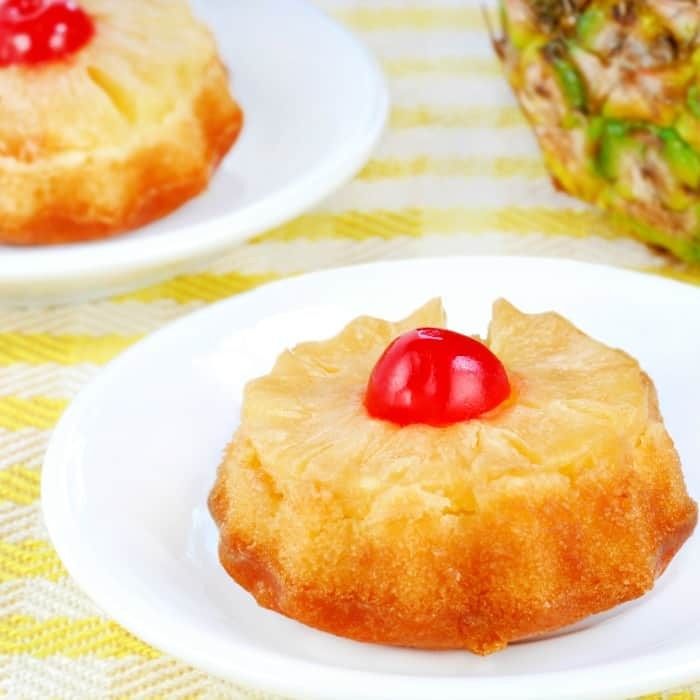 This recipe for Old Fashioned Pineapple Upside Down Cake has been passed down through generations in my family–as many as I can remember. When I was a kid, my mom didn’t even have a recipe–not for this, and not for much of anything! She just went to the kitchen and started putting ingredients in a bowl. As a teenager, I decided it was important to write my mom’s recipes down. Thank goodness I did that, because I wouldn’t want to lose these traditional recipes, like Old Fashioned Jam Cake or Old Fashioned Banana Pudding–but especially this one…it’s so good, I think I might have just keeled-over if I hadn’t written it down those years ago! LOL! 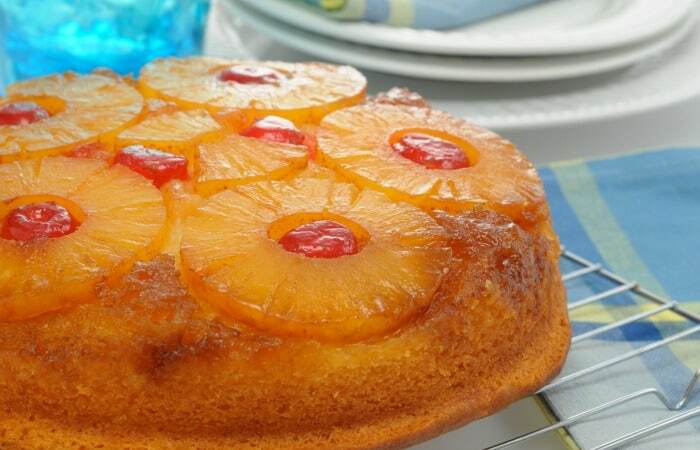 If you’ve never had home-made from scratch Old Fashioned Pineapple Upside Down Cake, you’re in for a real treat. This cake is fluffy, moist, and delicious! Every bite will be a delightful surprise for your tastebuds. 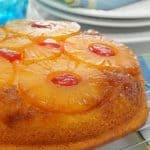 This recipe for Old Fashioned Pineapple Upside Down Cake has been passed down through generations in my family--as many as I can remember. Prepare your pan. You can use a large iron skillet (this is what my mom used) or a round cake pan--10 to 12 inch. Line the pan with waxed paper and trim the waxed paper along the top of the pan. Coat the waxed paper with 1 tablespoon Vegetable Oil, and sprinkle with 1/4 cup Light Brown Sugar. Arrange the Pineapple Rings around the bottom of the pan. Place one Cherry in the center of each Pineapple Ring, and the remaining Cherry in the center of the pan. 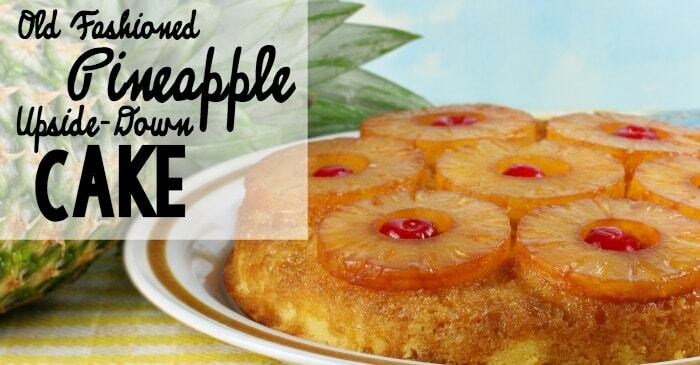 Pour the batter over the Pineapple Rings and Cherries. Bake for approximately 40 minutes, or until a toothpick inserted in the center comes out clean. Cover with a plate or cake plate and flip the pan and plate upside down together. Carefully and gently remove and discard the waxed paper. If you love this recipe and want to see more like it, be sure to sign up for our newsletter, below–we don’t spam and we’re really all about the yummy, so you’ll be getting that straight to your inbox if you do! LOL!